Just a casual weekend look today featuring a few wardrobe basics. 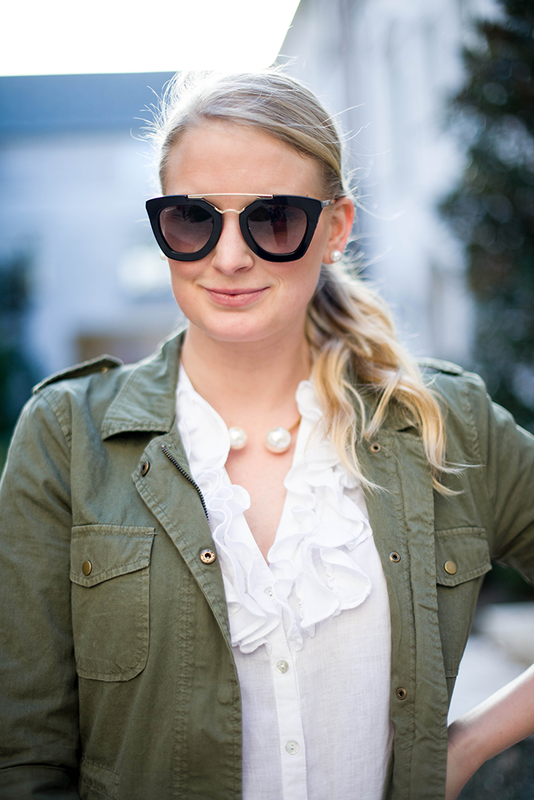 This military jacket by Lily Aldridge for Velvet has been in heavy rotation in my closet this season. It’s the best layering piece with lighter tops underneath and heavier jackets on top. I’ve also been getting a ton of use out of my Halston Heritage faux-leather pants (now on sale for $172!). They’re really comfortable and they don’t stretch out as much as real leather, which I like. Finally, I’ve had this Forever 21 tunic since college – kinda crazy right? It’s the only thing I ever bought there that lasted more than a couple months. Tunics are always high on my shopping list – the length is a major plus for moi. What are some of your favorite layering tools? Any recommendations? I’m always looking to update my season-less staples. PS – head over to D Magazine’s ShopTalk blog to peek into my bag in their Purse Spill feature. Thanks so much to D Magazine for having me! That’s a miracle for a forever21 top, but it is so pretty and soften the look so well with the jacket and leather pants. Congrats on your feature! Love this look, these sunglasses are the best! And congrats on your feature–I’m obsessed with that Oribe spray too! Great military jacket! Aren’t they so versatile?! My military vest is my go to layering piece as well! You are rocking those gorgeous sunglasses! Love that jacket and sandals too! You can’t go wrong with the classics and this is absolutely perfect – that clutch never gets old! LOVING the shoes. I’m such a sucker for a stripy sandal. Those glasses are fabulous! I have the same type of find from Forever 21, a light gray thin sweater, it has lasted me for like 4 years and it was like $14! Love this look. I absolutely adore the ruffles in you top! And that clutch is GORGEOUS! I got that same jacket for Christmas and I seriously can’t stop wearing it. Like you said it’s a perfect layering piece. I love how you accessorized this outfit! Adorable! Such a perfect timeless look. Can’t believe you snagged that at F21 and it’s lasted longer than a year! For me, timeless go-to pieces are Calypso tees – so soft and hold their shape after plenty of washes. Have a good weekend! Love this look! Especially the heels! When I saw that you were doing a military jacket look on ig today, you know I had to hop over to see. You are ALWAYS totally and perfectly chic! Loved the whole look today! Those shades are amaze! I want them! You have the BEST sunglass collection…ever. Also, that bag is so fun – love the whole outfit! major crushing on that jacket. I LOVE your Military style jacket! That with the leather makes it look so edgy and nice! Also the glasses are a great add on! What a beautiful pictures! I love the necklace! I love how your hair looks great in sun! Love this look! Tunics are my favorite layering piece…so versatile and comfortable too! Gorg! I also rely heavily on my green military-esque jacket. Other go to layering pieces are my black satin blazer and perfectly worn out denim jacket. I adore that necklace, how modern! That bag is amazing! You have a great eye on accessories in all the outfit post. Your necklace is so sweet! Love it! Loving this entire look! 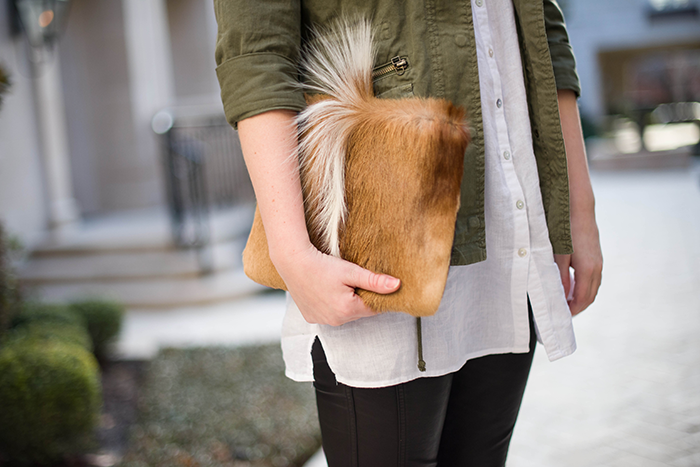 Majorly swooning over that clutch! Love this look. Very classic with the colors, yet modern. Those sunglasses are fabulous! That Proenza bag is gorgeous.. love it!